On June 23, 1960 the expansion Dallas Cowboys obtained veteran QB Eddie LeBaron from the Washington Redskins for 1961 first and sixth round draft choices. LeBaron had announced his retirement following the 1959 season in order to pursue his legal career, but indicated that he would be willing to play again provided that he was traded to Dallas, where he was setting up practice. He had gone to law school at George Washington University and received his degree in 1958. Also involved in the deal were C Frank Kuchta, formerly of Notre Dame, who was sent by the Redskins to Dallas for ex-Maryland star tackle Ray Krouse, a nine-year veteran who had played the last two years for the Colts. Neither played beyond 1960, and Kuchta was with the new American Football League’s Denver Broncos rather than the Cowboys. LeBaron had been surprisingly successful in the NFL, despite being only 5’7” and weighing 168 pounds. After starring at the College of the Pacific, which he had entered at age 16, he was taken by the Redskins in the 10th round of the 1950 draft. With a strong arm and outstanding ball-handling ability, he had proven himself in the college ranks and helped engineer an upset of the NFL Champion Eagles in the College All-Star Game. But pro football would have to wait due to a military commitment in the US Marines. He came back a decorated veteran of the Korean War and joined the Redskins in 1952 – the legendary Sammy Baugh’s final year. The diminutive quarterback took over for the all-time great as a rookie, also handling the team’s punting. LeBaron displayed great daring for a mediocre team that went 4-8. He completed 96 of 194 passes (49.5 %) for 1420 yards with 14 touchdowns and 15 interceptions. Following the ’53 season, and unhappy under Head Coach Curly Lambeau, he jumped to Calgary of the CFL where he played for his college coach, Larry Siemering. Returning to the Redskins in 1955 (Lambeau had been replaced by Joe Kuharich), he was selected to the Pro Bowl following a year in which the club went 8-4 and finished second in the Eastern Conference. While Washington’s best record since 1945 proved to be an aberration, LeBaron continued to play well for a losing team. Known as “The Little General”, he was selected to the Pro Bowl following the 1957 and ’58 seasons, averaging 9.0 and 9.4 yards per attempt, respectively, and leading the NFL in passing in the latter season (under the passer rating system then in use). In seven years with the Redskins, LeBaron threw for 8068 yards with 59 touchdowns and 88 interceptions. He also drew praise for his motivational ability and leadership – traits certainly attractive to an expansion team. The 1960 Cowboys, under defensive-minded Head Coach Tom Landry, were the usual first-year assortment of up-and-coming young players and veterans either past their prime or of little interest to other teams. A promising rookie quarterback had been obtained in the person of Don Meredith, a local product out of Southern Methodist, but he was strictly a work in progress and spent the first year seeing scant action and learning from LeBaron. The fledgling Cowboys had a veteran corps of receivers that included Pro Bowl TE Jim Doran, flanker Billy Howton, and split end Fred Dugan. However, the running game was mediocre, in addition to the offensive line. LeBaron passed for a respectable 1736 yards with 12 touchdowns, although he also gave up 25 interceptions. Dallas finished up at 0-11-1. The Cowboys were an improved team in 1961, going 4-9-1. The addition of rookie HB Don Perkins out of New Mexico, who rushed for 815 yards and earned selection to the Pro Bowl, helped the offense. While Meredith saw increased action at quarterback, LeBaron was still the primary starter and threw for 1741 yards with more TDs (14) than in ’60 and far fewer interceptions (16). The 31-year-old Howton, who was closing in on Don Hutson’s career pass receiving record, had 56 catches for 785 yards and four touchdowns, although flanker Frank Clarke created a greater stir with his 22.4-yard average gain and 9 TDs on 41 receptions for 919 yards. 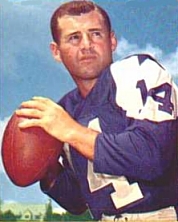 In 1962, Meredith threw more passes for the Cowboys (212 to 166) and in some instances alternated with LeBaron. But in his next-to-last season, the savvy veteran performed well, with a 57.2 completion percentage and 8.7 yards per attempt while compiling 1436 yards with 16 touchdowns and nine interceptions. He was selected to the Pro Bowl for the fourth time. He spent the ’63 season as Meredith’s backup before finally leaving the NFL for a full-time legal career. LeBaron would eventually return to pro football as general manager of the Atlanta Falcons for ten years (1977-87). Adding in his four-year stint with Dallas, his passing totals were 898 of 1796 throws (50.0 percent) for 13,399 yards with 104 TDs against 141 interceptions. Despite his small stature and not playing for contending teams, LeBaron was a well-regarded quarterback who showed great skill as a leader and play-caller. Although he typically couldn’t see over the linemen in front of him once the play started (and his receivers couldn’t see him either), he was adept at rolling out and was an effective passer. He also was generally regarded as the best ball-handler of his era. In Dallas, he made it possible for Don Meredith to be brought along slowly. As a postscript, the Redskins used the 1961 draft choices they obtained for LeBaron to choose QB Norm Snead out of Wake Forest in the first round and Illinois DB Joe Krakoski in the sixth. While Snead initially showed great promise and played a total of 16 seasons in the NFL, he failed to achieve his potential in three years with Washington and was dealt to Philadelphia in a celebrated trade for Sonny Jurgensen. Krakoski was with the Redskins for one year and intercepted four passes, but was waived prior to the ’62 season and went on to play for Oakland in the AFL.